sg-grainbot by Synthgeek is a Virtual Instrument and a Virtual Effect Audio Plugin. It functions as a VST Plugin. 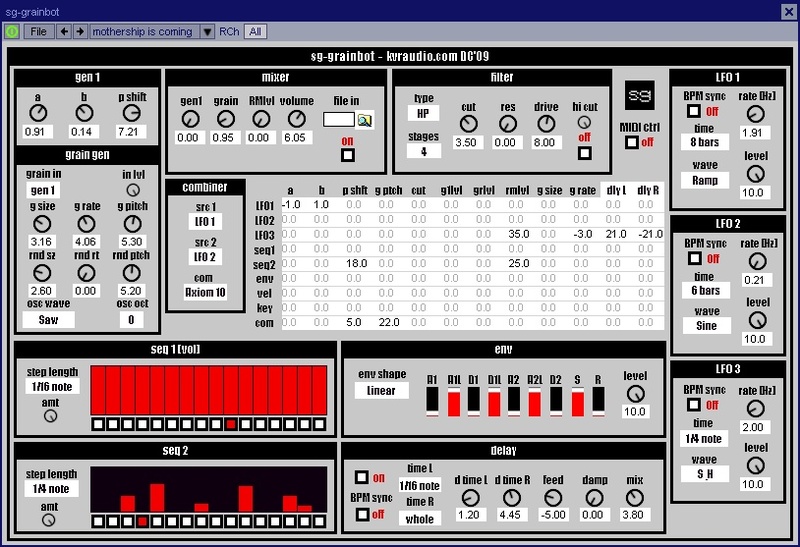 Grainbot is an experimental synth based on granular synthesis and mathematically generated noise. It's not made for traditional bass/lead/pad type stuff (though it can do that if pressed), but it is capable of a wide range of other sounds: mechanical and engine-type sounds, rhythmic percussion sequences, random bleepery, drones, ambiences, and more. It can also process external audio. There are two sound sources: the grain generator (which can granulate internal sound sources or an audio input), and "gen 1", a chaotic math-based sound generator. There is also a ring modulator which uses these two generators as its inputs. You can choose between 5 different input sources for the grain generator: live audio input, a built-in analog-style oscillator, the input amplitude modulated by the oscillator, gen 1, or audio input from a file. The sound generators are processed through a filter with 5 types (lo pass, hi pass, notch, and 2 flavors of band pass) and a selectable number of stages. There is also a stereo delay effect which can sync to host tempo (or not). Various parameters (including the delay effect) can be modulated with 2 step sequencers, 3 LFOs, and a 6-stage envelope. The modulation routing is provided via matrix. Besides the modulators mentioned above, there are also matrix inputs for key tracking and velocity, and a "combiner" which uses various math formulas to combine any two mod sources in various ways. 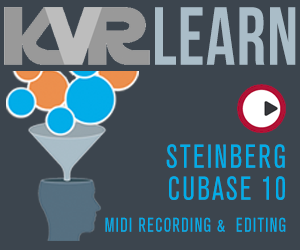 Originally released for the 2009 KVR Developer Challenge, since updated.